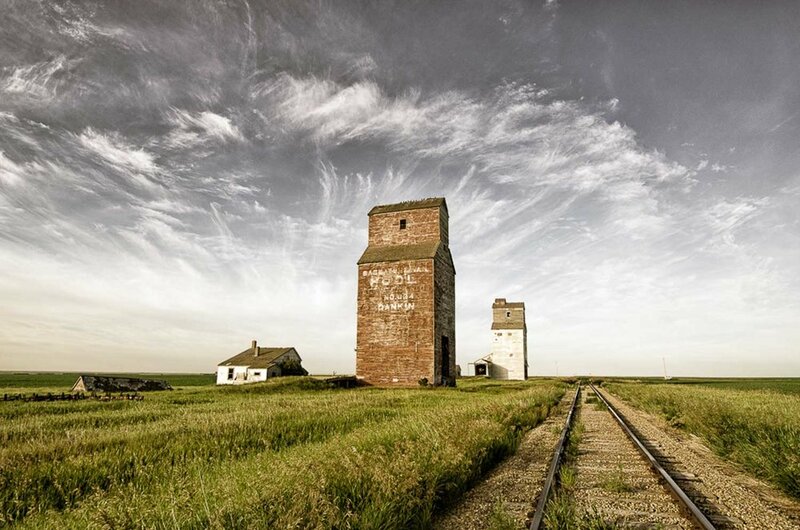 At one time, grain elevators could be found every 8 to 10 miles along all the railway lines in western Canada. That allowed most farmers to make a round trip to deliver grain with a horse and wagon in one day. Though they started appearing in the late 19th century, the number of grain elevators peaked in 1938, when there were nearly 6,000 primary (country) elevators in the Prairie provinces. Many factors led to the decline of the primary elevator: the Depression, increased mechanization, improved roads for transportation, rural depopulation, the closing of branch lines of the railway and the buying out or merging of the grain companies. Once they are closed and abandoned, elevators deteriorate quickly. They are often dismantled or destroyed in fires. Very few of the old elevators are still standing: in 2004 there were only 197 primary licenced grain elevators left in Saskatchewan. Since 2013, I have been photographing some of the remaining old grain elevators in Alberta, Saskatchewan and Manitoba. Over this time, I have come to love visiting and photographing these old Prairies beauties. The lovely old grain elevator in Liberty, Saskatchewan. The United Grain Growers grain elevator in Elva, Manitoba was built in 1916 and closed in 1967. This beautiful old Lake of the Woods elevator was built in the now abandoned town of Cameron somewhere between 1902 and 1910 and was closed in the late 1960s. The elevator of Fusilier, Saskatchewan and the small ghost town around it. The beautiful White Bear grain elevator, which was struck by lightning and burned down in 2017.